The Story Behind Photographing "The Buddha of Borobudur"
« A preview of “The Beautiful Reverence of Mexican Altars”. 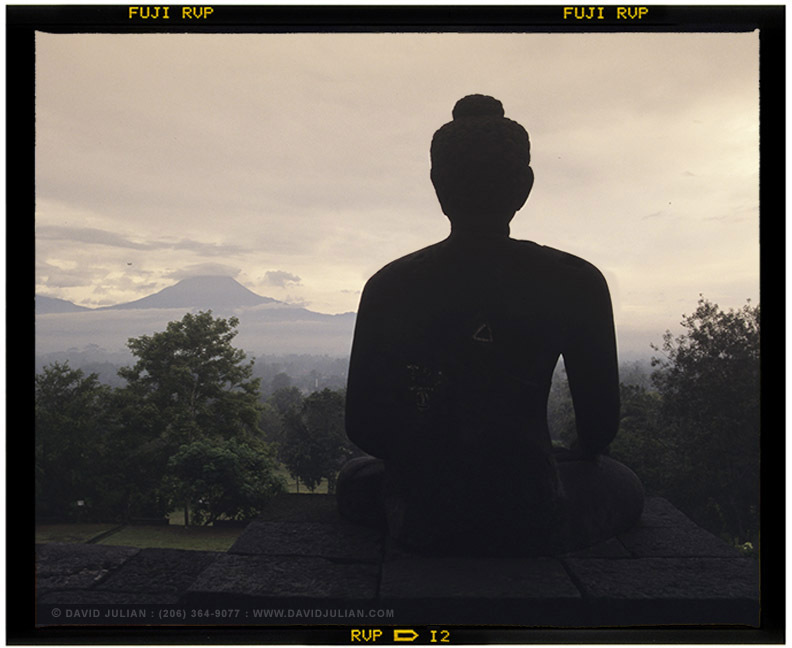 This is the story of my favorite and most collected images: “The Buddha of Borobudur“. I’m often asked about the location of this unusual place, and also how I made this image. I’ll describe my personal process, the gear I used and my Photoshop technique. Borobudur is a pyramidal Buddhist temple built in south central Java, Indonesia around 800 AD. I’ve learned from photographic travels that my best images come when I manage the excitement that could otherwise occupy my senses. When I have attempted to capture the quiet essence of a place while gabbing or shooting quickly, the resulting photographs feel less connective. Conversely, when I’ve shot a race, rodeo or parade, I match my energy, activity and shooting style to the event. My first trip to Indonesia was rich with personal discovery. It was an unforgettable experience that perfectly combined foreign travel and photography. I had scanned through back issues of National Geographic and Getty Images to find an interesting destination for a full month of cultural and photographic exploration. I became completely lost in research, as NatGeo made everywhere looks so incredible. I chose Java because I knew no one who had been there. It was 1996, and I was still traveling with a heavy Pentax 6×7, a Nikon FM2 and a taped-up plastic Holga. I took enough lenses to cover anything from a spider to a mountain. A carton of various film types and a steel Gitzo tripod filled my backpack leaving barely enough room for clothing, a med kit and some gifts for locals I’d meet. I felt willing to shoulder such a load rather than regret not having equipment choices to cover a variety of situations. I fretted my over-equipping but I was an inexperienced growing novice and of course, completely insane. I began the trip in gorgeous Bali, then sailed to Lombok and the Gili Islands. (I’ll cover those in a future post). I eventually flew to Java, choosing the bustling culturally-rich city of Yogyacarta as a touring base. I caught a lift on a Bechak pedaled by a young Indonesian man named Jakob, who resembled an Indonesian Jimi Hendrix. We went to find a few Javanese beers and soon took turns pedaling each other around the chaotic market district, laughing and trading knowledge across our obvious language barriers. He urged me to try the tasty locally-grilled chicken wings. Turned out they were bats. He laughed so hard I saw his gold fillings, and I wanted to slowly remove them. The following morning I hopped a colorful public bus blasting Indonesian rock and roll, and headed to the immense and exotic temples of Prambanan and Borobudur. It began raining cats and dogs, or more appropriate to Java, bats and frogs. For the next loud and bumpy hour, the roads flooded into rivers, and I felt my excitement wane under dark and unpleasant skies. We arrived in a downpour and thick smoke that stung my eyes. Borobudur was barely visible. We were told that local farmers had been burning bonfires of chaff, and the downpour had turned the flames into a dense ceiling of acrid smoke. As I climbed the pyramid wearing a poncho and bandana to breathe through, I rose above the smoke and my doubts. It was breathtaking. Soon, it seemed I was on a giant floating island of bell-shaped prayer stupas. I had ascended both physically and mentally. The lifting smoke provided a dramatic fog-like effect, and I knew it would dissipate if I didn’t work quickly. I had brought along the Pentax and Nikon, and three lenses. I wanted to preserve the spiritual feeling of the temple, so I imagined a simple composite that would convey the presence of Buddhism within this vast structure. I scouted the top of the pyramid for half an hour to find ideal elements and a viewpoint for the image. I wanted something real, calm and serene. I also wanted to capture the concept that each of the 72 bell-shaped Stupas that encircled the pyramid contained a small stone buddha. I would treat the buddha as a subtle transparent spirit looking over the prayer stupas. After making several conventional shots with the Nikon, I mounted the big Pentax onto my tripod and over-exposed and de-focused a lone Buddha overlooking the valley below. I then made several photographs of the stupas with a 45mm wide angle lens to accentuate their form and size. A month later I joined 120mm scans of the two images carefully in the early Photoshop 4 and controlled the tonal range and color selectively using masked Adjustment Layers to create a timeless, ethereal mood. Below are the original captures, and I have updated the original Photoshop 4 file. I also converted parts of the file to take advantage of Photoshop CS6’s more evolved features. Original capture of Stupas on Fuji Velvia 120. Note the magenta color shift, which i assumed was due to the heat of travel. Oddly, none of my 25mm Velvia suffered the same fate. Could the metal canisters have kept it cooler? The original composite at the top of this post was created in Photoshop 4. Above is a snapshot of that file updated to CS6. To preserve the original look, I had to convert the original PS4 Channel Mixer adjustment layers to the B+W adjustment layers I much prefer to use in CS6. Other adjustment layers, such as Curves and Color Balance were carefully masked to affect selected parts of the image. Precise control of tones, contrast and color balance is essential to my work. It may take me a second to capture an image and an hour to artfully process. The photograph begins in my mind, travels through the camera and computer where I craft it into what I envisioned. This process is one that I teach individually and in my workshops. I urge everyone to visit Bali with a camera. Let me know if you are headed to Java, and I’ll tell you what not to eat. I have a few seats left in Maine for “Creativity and Invention with Photoshop“. To stay up to date on all of my workshops, subscribe here. For details on Borobudur, see this Wiki. Tagged Borobudur, Buddha, composition, creativity, Energy, fog, Indonesia, Java, Mystical, photography, Prayer, Pyramid, Smoke, Spiritual, Stupa, Temple, workshop, Yogyakarta. Bookmark the permalink.